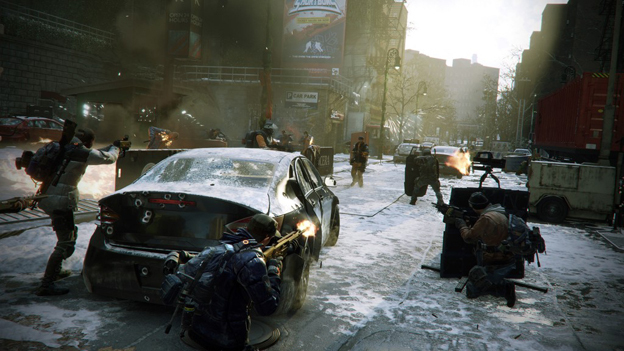 Is The Division a Destiny Killer, or Destined to Flop? 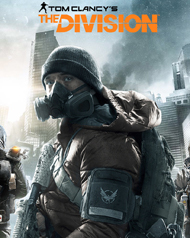 So far The Division seems to be a mixed bag of unexpected surprises and unrealized expectations. Everything I've learned about the story and everything I played through myself over a long weekend of beta sampling has raised more questions than answers, and it's hard to know just how I feel about it all. One thing I do know for sure: The Division is not Destiny, and that might not be such a good thing after all. We've been talking about The Division for years now, but it's actually hitting store shelves at a very interesting time – a time when Destiny players (some 20+ million strong) are realizing that they may be ready for something new. A content drought for Bungie means an enormous opportunity for Ubisoft, and because both of these games are online shooter / RPG hybrids, comparisons between the two have been consistent. I've spent enough time patrolling the gang-infested streets of New York and braving the Wild West that is The Division's Dark Zone to get a great feel for the game, and I can tell you right now that it's no Destiny. Now in a way that's good, because unlike Destiny, we actually have a pretty decent story on our hands here. Some unknown agency or entity planted a deadly virus onto banknotes that were issued and used on Black Friday, the busiest shopping day of the year. As bills exchanged hands and people spent the day packed in close proximity to one another, the virus spread rapidly and pretty soon a pandemic swept the nation bringing chaos and death along with it. You're specially trained (along with other agents) for just such a scenario, and now it's time for you to restore order. It's definitely Tom Clancy, and it's definitely better than anything Destiny ever brought to the table. One area where The Division is lacking, though, is variety. Apparently as soon as the pandemic got out of hand, all of the gangs and criminals looted every Old Navy in New York. All of the enemies so far are just dudes in hoodies or dudes in hazmat suits. At least in Destiny there are multiple races and dozens of different enemy types to combat. They all look great, too. I could say the same about the environments and aesthetic in general. I'm used to completing missions while seeing meteorites rain down through stormy Venusian skies, or staring out into a twinkling ribbon of our Milky Way from the surface of the moon. 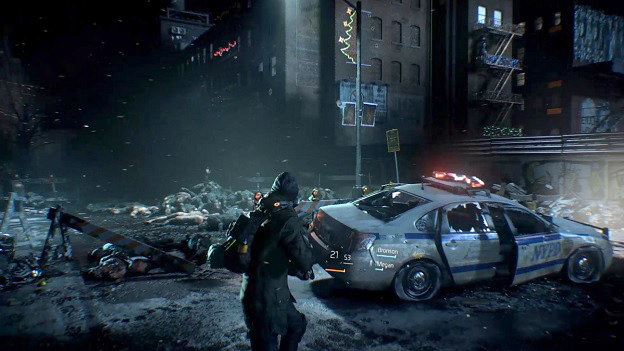 While The Division isn't a bad looking game at all, the aesthetic does seem a little too realistic for its own good. Abandoned buildings, streets littered with wreckage and waste, a dark and untidy base of operations... Will we want to come back all of this for dozens – or hundreds – of hours? If so, the abilities that we unlock further along our agent's skill tree are going to have to change the gameplay in a huge way. Honestly, I found combat to be a bit of a bore. We've all played Gears of War, so we know that cover-based third-person firefights can be very intense and a lot of fun. Something was missing in the The Division. I'd pull the trigger and unload magazines into my stylish foes, but I just didn't get the release of dopamine that I was expecting. I'm hoping very much that the high-level skills are going to change that. Perhaps once your medical, tech, and security wings are fully upgraded and you're playing with a full deck of cards, things will turn around. I'm hoping that cooler abilities will change the way I look at the gear as well, because I didn't find too much to get excited about. The awesome loot that you'll be hoping to pick up will a lot of the time just look like random crap: standard rifles, caps, etc. With Destiny, right from the start your guardian looks like a badass, and you're constantly upgrading and progressing. 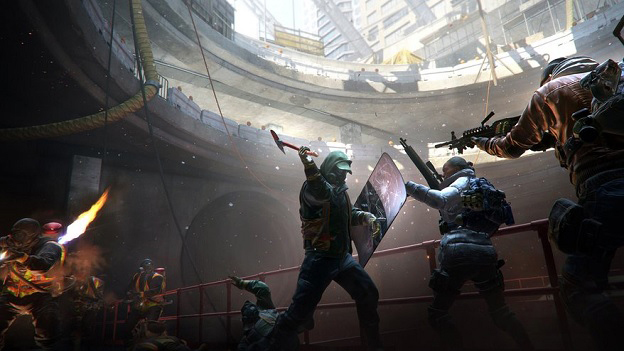 Nothing in The Division looked cool or felt like a big upgrade, but there's always the chance that after you invest in a certain type of build you'll start hunting for very specific kinds of loot to compliment your role. My Dark Zone experience was one of general aggression, and rascals ruled the day. Playing alone, I fell prey to multiple groups of 2-3 stalkers who would follow me to extraction zones and murder me, or otherwise shoot me on sight. I can't imagine feeling a huge incentive to invest time exploring the Dark Zone for valuable gear if the community decides that it is to be a place for mugging and trolling. All said, I'm remaining cautiously optimistic about The Division. I think Ubisoft put enough skin in the game to actually care how it turns out, and I'm willing to bet that playing with an agent equipped with a dynamic set of abilities and complimentary gear might turn the devastated streets of New York City into one of the best playgrounds and most intense battlefields that we see all year. As long as the endgame is engaging and the bulk of the story isn't kept behind paid expansions, this could turn out to be one of the biggest games of this console generation. 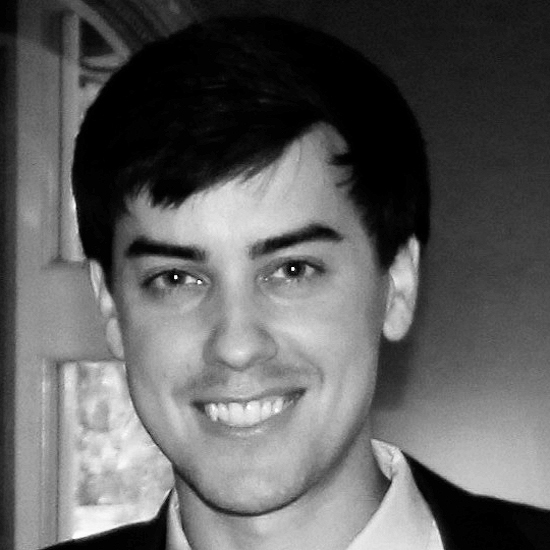 If it continues to play as it has during the early beta experience, though, it could quickly fizzle out. Take Back New York – Welcome to a new generation experience in a persistent and dynamic environment, where exploration and player progression are essential. Teaming up with other Division agents, your mission is to restore order, investigate the source of the virus and to take back New York. A Living and Breathing World – Enter a universe where the time of day and weather conditions deeply impact your gaming experience. Use the environment to a strategic advantage to dominate fights and ambush your enemies. Urban Jungle – New York City is being overrun by hostile groups that are trying to take advantage of the crisis. One such group is The Cleaners, who travel throughout the city wherever the contagion levels rise. Wearing hazmat suits and wielding flamethrowers, The Cleaners leave nothing but ash in their wake. Gear Up – As a member of The Division, harness state-of-the-art technology. Customize your character and your back-pack, your lifeline in the event of a collapse, and communicate with the other agents at all times with your smart watch. Customize and level up your weapons. The choices you make will help forge a recovery or plunge the city deeper into chaos.